The newly purpos-built theatre is modeled more like a movie studio with a series of 'sets' that the audience walks through (there is no seating for the 1st hour of the show) rather than the conventional format with a stage and a seated audience (yes, there is one during the finale). The modern architecture exhibits symbolic reference to what appears to be the roofscape of the old city. Roof tiles are creatively stacked and arranged as decorative elements on the façade. As one enters through portals into the darkened spaces, actors in period costumes are perched at vantage points to guide you through – or you just follow the crowd, which comprise mainly of local Chinese (during our afternoon show). There are at least 6 different thematic sets. Even if you do not understand the continuous Putonghua narration, the staging is visually captivating, beautifully done and will be able to sustain interest – better still if you understand the language or come with a translator. Lighting is ingeniously used to create textures, backdrops and weather conditions. The costumes are detailed and gorgeous. 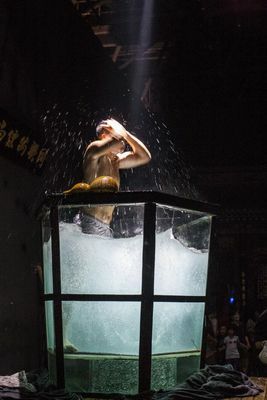 Some of the most memorable moments were set at the ‘ancient fortress wall’, the ‘selection of the royal concubine’, the ‘bathing scene’ and the ‘noodle-making’ dance – presumably all part of the historical experiences of Pingyao & Shanxi. 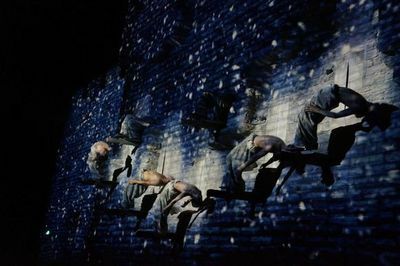 By now, the ‘Impressions’ series (first created by famous award-winning Chinese director Zhang Yimou) is already well known for its world-class quality and impressive staging. While the other shows in other parts of China take advantage of the natural outdoor scenery of their respective locations, the indoor Pingyao version comes across as being far more intimate and interactive. The audience is part of each scene and often the actors speak directly to you, especially in the ‘street market’ set. This makes Impressions Pingyao unique and more exciting. Be prepared for a fair amount of jostling (as is expected in this country) for a preferred spot to watch the action at each set. Fortunately the sets are large enough to accommodate everyone very comfortably. You do not need to be close to the actors to hear what they are saying as the sound system is excellent. While photography is permitte without flash, everyone love it. After 90 emotional minutes in the darkened stages, you emerge taking with you a better understanding of the rich Shanxi history & Pingyao pride. This comes highly recommended! If you like the show tour: 750yuan for two persons which include the golf car picking up and drop off service between the hotel and theater, translation, and 2 show tickets. Chinese Official Holiday is very busy, the price of show tickets will be high price due to the ticket scalper. Notice: if you are allergic to the wheat flour, you can not see this show, because of they will have noodle making show in the last 30 minutes.